Fix your slice in a few simple steps and a lot of practice. 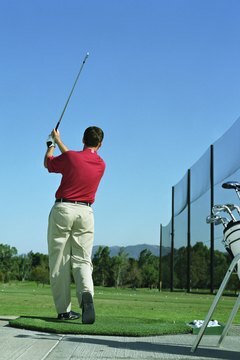 Having an outside to inside golf swing can reek some real havoc with the golf game. It can cause you to slice and spray the ball all over the course. In the end, an outside golf swing can create pure confusion and the desire to give up the game for good. But there's a very simple recipe for fixing an outside golf swing and once you get it down, it will make playing the game much easier. Take your normal ball address stance. Line up so that the ball is in the middle of your stance. Make sure that you are up over the ball and you don't have to extend to make contact. Your stance should be comfortable. Imagine your ball is sitting on one of two railroad tracks. The track that your ball is sitting on should be running off towards where you want the ball to go. Imagine your feet are on the other track. Once again, the track under your feet is running off towards the desired destination of your ball. Draw back your club. Focus on keeping your club head inside the track that your ball is sitting on. This will keep your club head in and thus help you stay inside instead of outside on your backswing. Keep your club head inside that outer track as you come back down on the ball and follow through. Practice the move. It shouldn't be that much of an adjustment to your regular swing. Eventually, it will become second nature. The really nice thing about the railroad track swing is that it allows you to rotate tighter and this will eventually end up giving you more power in your swing as well.